Most Irish imagery tends to be associated with being lucky, especially things like Leprechauns and four-leaf clovers. So, without further ado let’s see what the luck of the Irish can do for you! 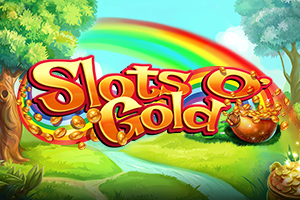 Blueprint Gaming have developed a bright and colourful game named Slots o’ Gold and it hosts a progressive jackpot too. Slots o’ Gold is a 5-reel, 10 fixed pay line slot that offers a much lower RTP than we have seen before, of just 92.48%. But as mentioned above there is that progressive jackpot to take into consideration, before you shrug off the luck of the Irish as a fable. In the background is a lush emerald isle full of rainbows and pots of gold. The music tinkling along is bearable, but after a while you may want to switch it off; we did! Bet Amounts – Betting begins at 20p per spin and can be increased to a maximum of £500 per spin, giving a lot of scope for stakes in between. Adjust your bet amount with the up and down arrows to the left of the screen. Wild Symbol – The lucky leprechaun is your wild symbol and he will substitute for all other symbols, creating wins wherever possible. He will however only appear on reels 2, 3 and 4 throughout the game. Rainbow Gold Symbol – This particular symbol is going to prove fruitful in the right quantities. When it lands, be that one or ten times then all the symbols will turn into something else. Obviously the more of the bonus symbol you land the better, but even one extra symbol turning can be helpful in the smallest or biggest of ways. Rainbow Respin Feature – As well as being your wild, the leprechaun triggers the rainbow respin too. You will see the reel that your leprechaun wild lands on will expand and lock in place as the other reels respin. The wild that was already in place will now contribute to a new set of wins. In some cases you may land another leprechaun wild, in which case both reels will then be locked in place for one more respin. This will happen every time you land a leprechaun wild in a consecutive run and will end once no new leprechaun wilds land. Progressive Jackpot – Slots o’ Gold links its progressive jackpot to the Blueprint Gaming Jackpot King network game. This means that the pot is rising continuously from all games within the network. In order to enter the jackpot feature you need to land 5 jackpot king icons on the reels; one on each from reels 1 to 5. Once done you will be taken to a new screen, where you will begin spinning the reels to collect crowns. The more crowns you collect the bigger the prize pot. Land 15 crowns and it will take you to the wheel king. Here you will have a chance at the progressive jackpot prize. But if you don’t manage to win that, you will get a huge multiplier on your bet amount and current prize pot. 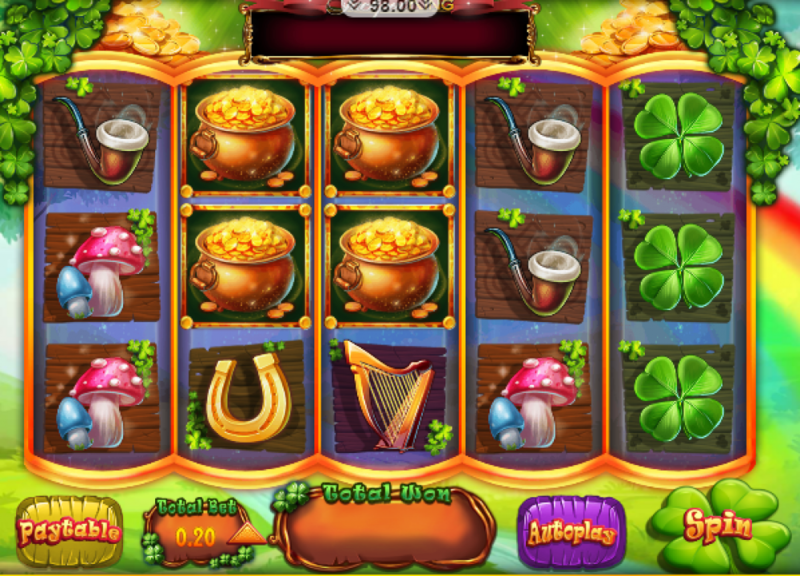 Although the RTP seems super low, Slots o’ Gold is still exceedingly popular amongst players. We can only assume the progressive jackpot has something to do with it. Well, that and the amazing wild respins, because let’s face it that can pay off if you land those pesky leprechauns consecutively. The backing sounds and music drove us a bit batty after a while, but aside from that we have literally nothing else negative to say about Slots o’ Gold. Not even a complaint about the lack of features because we actually didn’t miss them. This is due to the amount of times we hit the wild respins and the pots of gold bonus on the reels. Who needs lots of fancy mini games and features anyway, because simplicity is key in some cases and it is definitely the case here.